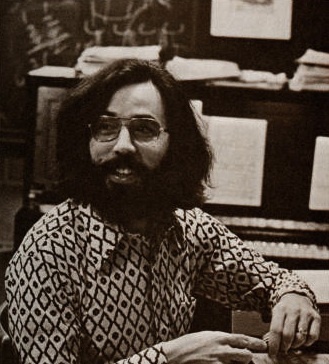 Donald J. Funes (1939–1999) was an influential music educator, composer and conductor. His musical interests spanned Andean and Indian music, jazz, classical music and the contemporary Western avant-garde. A flutist, he was a student of the Indian bansuri flute and Andean panpipes. Don Funes introduced numerous future composers and performers to electronic music. Educated at Western Washington University (BA, MA) and the University of Oregon (DMA), Funes’ career as an educator included membership on the faculties of the State University of New York at Potsdam’s Crane School of Music, Northern Illinois University’s School of Music (where he served as Director), and during the final decade of his life, California State University at San Marcos, where he was founding Head of the Department of Visual and Performing Arts. Fuzzy Dice	(1974)	Crane School of Music Live Electronic Music Ensemble: saxophone: Bob Moore (first solo), Michael Saarie (second solo), Steve Greenfield, Gary Smulyan, and Bob Seligson; flute: Hank Welnicki, Donald Funes, Ellen Shifrin, and Liz Toleno; trombone: Richard Boz and Chris Truelson; bassoon: David Katz; oboe: Steve Owen; tuba: Doug Weber; strings: Debra Terelli and Steve? ; keyboards: Steven Bach, Mitchel Forman, Bob Gluck, and Mark Haag; electric guitar: Phil Moylan; electric bass: David Maswick and Mark Haag; voice and percussion: Joshua Worby; vibraphone: Ray Bennett; drums: Frosty; and others.